Group Event – Shoot with a World Champion Archer! Do you have 5-15 adventurous people in your company or friends? Want to try archery together with a World Champion Archer? Why not come and try archery and see if You are the new Robin Hood, Legolas, Katniss Everdeen, Princess Merida or Rambo! Why not arrange a new, different and exciting event that fits everyone? Archery is a lot of fun for groups of all ages, varying ages, varying physical strength and condition, male-female, boy-girl… everybody can participate and enjoy in archery together regardless of prior experience and skill level. We have bows for groups and people of all sizes, strength and physical condition. Also for You. You just need to have proper flat soled shoes, no high heels. We will provide everything else. Robin Hood of Espoo is a club of World Champion archers. For this event, and calendars permitting, your guide and coach to archery will be Ms. Anne Lantee, World Champion in Compound Field Archery. Events run about two hours of coaching, shooting and playful competition. Events can be arranged in various ways, please contact us for details! 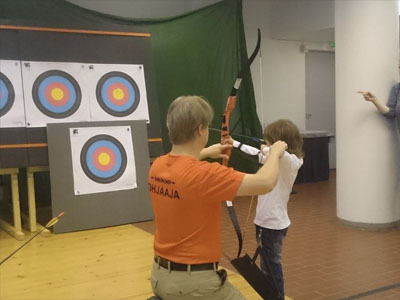 During the winter, the group shooting events are arranged in the Tuulimäki archery range in Tapiola, and during summer season the place is usually the Ruskeasuo archery range, Helsinki Central Park. It’s also possible to arrange events at our field course at Oittaa. Events are usually held by archery world champion Ms. Anne Lantee, though other professional instructors are also possible in case Anne is not available for the event. Why not make your own event different and memorable, a real bullseye? We can bring a complete archery experience to your event with all necessary equipment, including a safe shooting range, everything on the location! Archery is accessible to all people making it a perfect choice for a sports oriented event attraction. All your guests can give it a try and enjoy it! 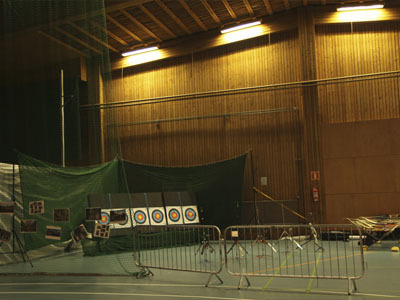 Robin Hood Club has brought archery to school’s sport events, various youth events, trade shows, sports museum, etc. ESPOO LIVE! Hood arranged archery experience for couple of hundred youths at Otahalli, year 2014. “Reissumies” exhibition about Tapio Rautavaara was quite polular and over 100 visitors tried archery at Hood’s stand!